Tuna casseroles are easy on the budget and always comforting. Here are our top 12 tuna casserole recipes, including tuna with spaghetti, a cheesy tuna and macaroni casserole, a tuna pie, and more. Most casseroles are versatile. Feel free to change things up with different pasta shapes, a combination of cheeses, or alternative toppings. If the casserole calls for condensed soup, use a different flavor. Crushed potato chips or tortilla chips make unique toppings and don't forget the standard saltines, Ritz crackers, and buttered bread crumbs. Crumbled French fried onion rings will add both texture and flavor. This classic tuna noodle casserole is homey and comforting, and one you might remember from childhood. The homemade sauce brings everything together. A bit of mayonnaise adds a unique flavor to the basic white sauce. Feel free to omit the mushrooms or add some shredded cheese to the buttery ​breadcrumb topping. 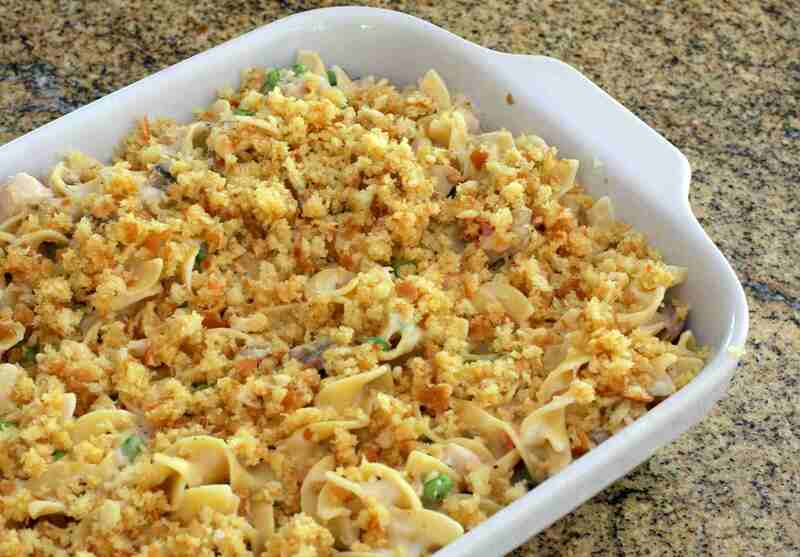 The cheese cracker topping adds unexpected color, crunch, and flavor to this tasty tuna and shells casserole. You can make the casserole with pasta shells, but macaroni or another kind of small pasta shape would work just as well. This recipe makes a big casserole, enough for a family of 6 or 8. It's a good choice for a potluck as well. You can make this delicious tuna, spinach, and cheese casserole with mini farfalle, but feel free to substitute elbows, small shells, mini penne, rotini, or similar pasta. This tuna noodle florentine casserole would also be great with cooked chopped kale. This easy tuna noodle bake is both flavorful and budget-friendly. Instead of the breadcrumb topping, crumble some potato chips or French fried onion rings over the casserole. For a satisfying family meal, serve this cheesy tuna casserole with a simple tossed green salad and hot, freshly baked biscuits. It's a very easy one-pot meal with cheese, vegetables, and a buttery breadcrumb topping. Tetrazzini is often associated with turkey, but other proteins may be used. In this version, tuna teams up with spaghetti and Parmesan cheese for an easy and tasty baked dish. Peas and green onions add color to the dish and make this tuna tetrazzini a complete meal. Parmesan cheese and a splash of sherry flavor this tuna and pasta bake. Cooked peas make it a one-dish meal. Serve this tuna farfalle casserole with a simple salad or sliced fresh tomatoes. Your family will love this flavorful mixture. This tuna, cheese and rice casserole makes a satisfying family meal, perfect for any night of the week. A creamy sauce, vegetables, and tuna are combined to make a thick, cheesy filling for this tuna pot pie. Use a homemade pastry or refrigerated ready-made crust. Mixed vegetables and hard-boiled eggs make this tuna casserole with macaroni a hearty meal. Serve it with biscuits or a simple tossed salad. This simple tuna and shells with cheese is actually a skillet recipe. The shells and cheese are super easy. Just add the flaked tuna and enjoy! How Do You Boil a Bushel of Crabs?